PhD student Matt tells us about his time spent studying material within the world-renowned Samuel Beckett archive, and the archive of actor Billie Whitelaw. A selection of Billie Whitelaw’s copies of Beckett scripts (BW A/2/4, BW A/3/2 & BW A/4). I am researching the production histories of Samuel Beckett’s drama in London as part of my PhD attached to the AHRC Staging Beckett project in the Department of Film, Theatre & Television. This research has involved a significant amount of archival explorations in a number of UK and international repositories including the Victoria and Albert Museum, the British Library, the National Theatre Archive and the Harry Ransom Center in Austin, Texas. Luckily for me, Reading has excellent resources relating to Beckett’s theatre in performance through the Beckett Collection and the James and Elizabeth Knowlson Collection and as a result I have spent numerous hours in the Reading Room at MERL viewing theatre ephemera ranging from programmes and reviews to photographs and interviews. One collection that has made an interesting contribution to my research and interest in Beckettian performance is the recently acquired Billie Whitelaw Collection. Whitelaw and Beckett closely collaborated on significant performances of Play, Not I, Footfalls, Happy Days and Rockaby in notable London theatres and this collection contains Whitelaw’s working scripts for these productions. These colourful and heavily annotated typescripts epitomise the detail and diligence given to these texts by Whitelaw during the many arduous hours she and Beckett spent in rehearsals together. This collection also includes some handwritten notes by Beckett when he supervised or directed Whitelaw in her plays. On the page Not I, for example, may appear like a nonsensical monologue of words or phrases, though through Beckett’s notes it is possible to see how the narrative of this unnamed woman has more of a structure than meets the eye, as he has carefully organised the play into acts noting its repetitions, interruptions, memories of the past and stream of thoughts. They offer a snapshot of Beckett’s creative process and his meticulousness as a director, which continues to fascinate and intrigue scholars and practitioners of his work. 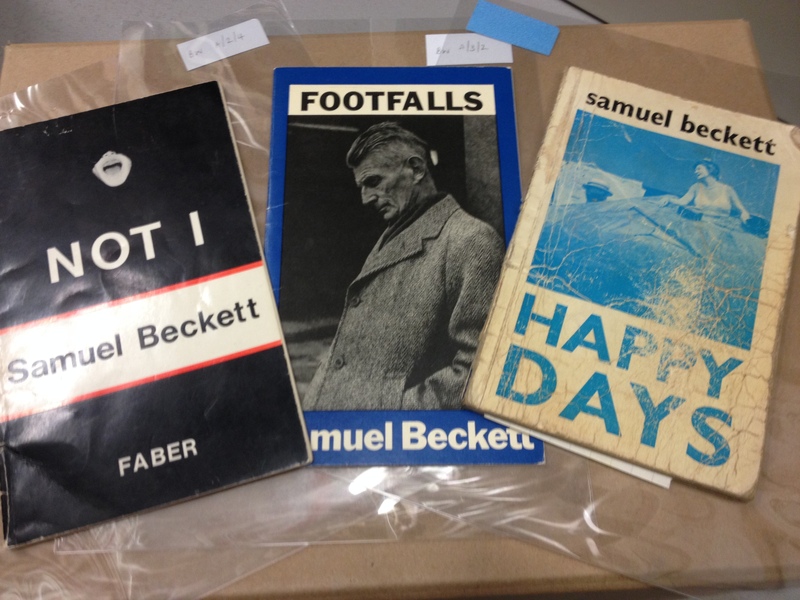 To learn more about the archive of Samuel Beckett click here, and you can find out more about the Billie Whitelaw archive here. The Billie Whitelaw archive is a relatively recent acquisition and you can read more about its arrival at Reading in a previous blog post.